Preheat the oven to 350°F. Lightly coat an 8x8-inch pan with cooking spray. Add the Bisquick to a medium-size mixing bowl. 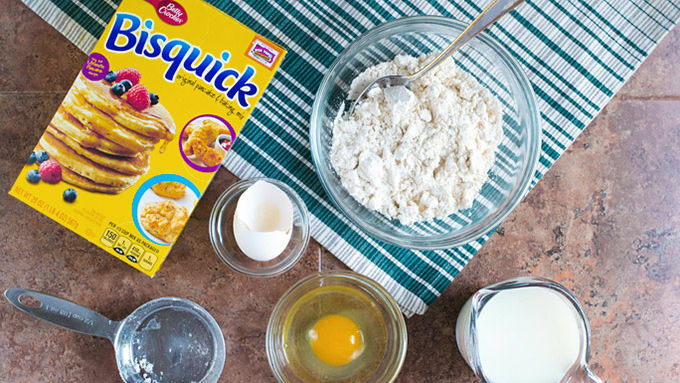 In a small mixing bowl or large measuring cup, whisk together the milk, egg, and canola oil. Add all at once to the Bisquick and stir with a fork, just until combined. The batter will appear lumpy. Gently fold in desired mix-ins. Bake bars for approximately 20 minutes, until a toothpick inserted in the center comes out clean. The cooking time may vary depending upon the quantity of mix-ins used. Let bars cool, slice into eight pieces. Serve immediately, pack on the go, or freeze for up to one month. Store leftover pancake bars in the refrigerator for 3 days or wrap and freeze for up to 1 month. 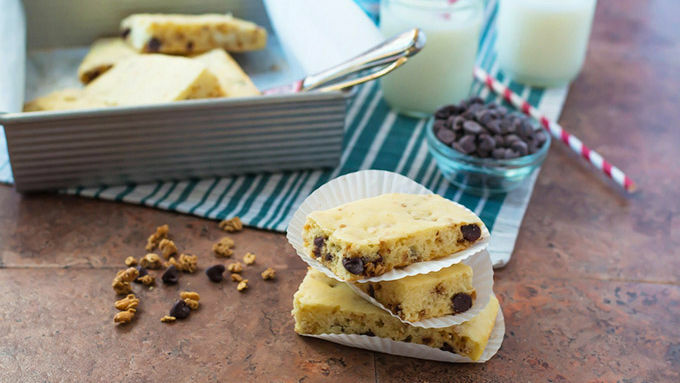 Easy-to-make bars that you can easily adapt to fit your favorite toppings – and take on the go, too! I snack for the good of humanity. If I don’t eat every few hours, I devolve into a huge grouch. No one deserves to have that kind of misery inflicted upon them! In addition to keeping me full, happy, and healthy, snacks prevent me from unleashing my "hanger" on unsuspecting co-workers. 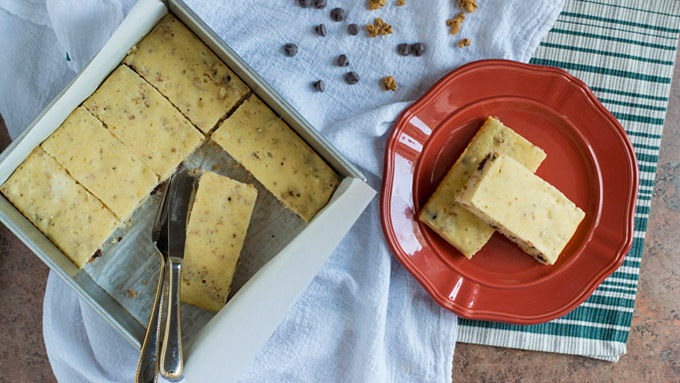 I try to keep a few easy-to-carry, reasonably healthy foods on my person at all times, and these Pancake Breakfast Bars are my latest favorite. Fluffy and filling, these quick and easy bites are endlessly adaptable, portable, and make a totally tasty breakfast or snack on the go. They're are a snap to make, thanks to Bisquick. Gently fold in any of your favorite fruits (dried, fresh, or frozen and thawed all work well), nuts, or chips. I used Cascadian Farms granola to make the bars heartier, along with chocolate chips to make them… wait, do I need a reason for chocolate? Once the bars have cooled, slice them into bars. You can enjoy them immediately for breakfast, freeze them for later, or wrap them up and bring them on the go. When I have time to sit down, I like mine warmed up with Yoplait Vanilla Greek Yogurt for dipping. Whether you're looking for an easy, yummy breakfast, an on-the-go bite, or an after school/work snack, Pancake Breakfast Bars are your man! Er, bar. Just trust me and bake them; you’ll love ‘em.